Everything you need to know to make beef the ultimate muscle food. We wouldn't steer you wrong. Once outlawed by the nutrition police, forcing even the mightiest carnivore to consider trying tofu, beef is now back in fashion. Bodybuilders everywhere are trading in a skinless chicken breast or two for a nice, thick steak. And for good reason: Any way you slice it, beef packs some serious protein and other vital nutrients. But the buyer should still beware. Choose the right cut and you've got a high-octane muscle food; choose the wrong one and you could be sending your buff-to-blubber ratio in a downward spiral. "Protein is the most obvious nutrient in beef that can benefit anyone who is training," says Rick Hall, a registered dietitian and nutrition lecturer at Arizona State University (Tempe). And beef doesn't contain just any run-of-the-mill protein. It boasts an impressive collection of the nine essential amino acids and has a high biological value, which means it's very digestible and usable by the body, Hall explains. In fact, studies show that foods with a high biological value are what you should hunt for to repair those muscles postworkout. But beef's nutritional virtues extend well beyond protein. Beneficial minerals in beef include the antioxidant selenium, highly absorbable iron and immune-boosting zinc, with the most well-represented vitamins being thiamin, riboflavin, niacin, pantothenic acid, B6 and B12. "Several of these micronutrients are involved in energy metabolism and help the body utilize sources of fuel such as carbohydrates and fat," notes Hall. And with roughly 2 grams of creatine per pound, beef can give your body some of the creatine it needs to push some serious weight. What about the fat content? Yes, that steak or beef burger contains more fat than your good old skinless chicken breast. But some saturated fat is necessary for maintaining testosterone levels, and about one-third of beef's saturated fat is stearic acid—which, Hall says, has a neutral effect on blood cholesterol levels. Even so, this leaves a pretty big chunk of other saturated fatty acids like palmitic acid that can inflict serious heart damage. That's why nutrition professionals and even the beef councils recommend choosing leaner cuts of beef. "The leaner the cut, the more muscle-building protein per ounce," Hall points out. Although several cuts are good, round cuts—with the best protein-to-fat ratio—stand above the rest. " Loin cuts are also lower in fat and worth stocking in your freezer," remarks Kyle Shadix, a New York—based chef and dietitian. A good indication of fat content is the color of the meat; deeper red meats are often the leaner varieties. Beef is graded based on its leanness, how it tastes and the age of the animal when it meets its maker. "Select" cuts are leaner than "choice" cuts, which are leaner than "prime" cuts. 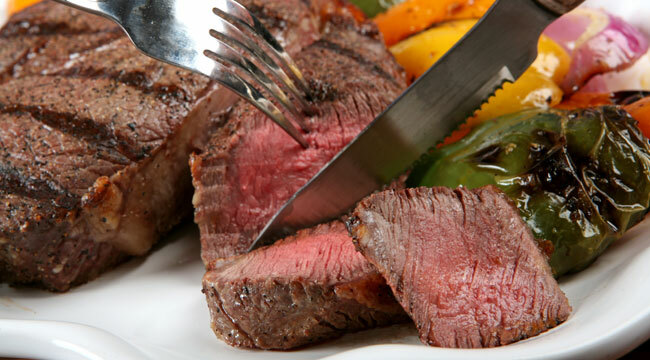 Prime cuts are primarily found in restaurants. "You'll notice less marbling in select cuts," Shadix explains. And while this is certainly good for your arteries, the palate can suffer since this cut is less tender and juicy than choice or prime cuts. Marinating a select cut, however, can make even the leanest of steaks taste like heaven.